This book offers a firsthand account of reporting violence in Punjab, once considered toughest assignments for journalists. During the peak of militancy in Punjab from April 1978 to 1995, the journalists were at the receiving end of the morbid State and the trigger-happy melancholic militants. These torturous years were marked by a real fear of the gun, as a large number of editors, reporters and their associates were prey to the marauders in different garbs. It was also a period when information was hard to obtain and write about as the police laced almost each news story with lies and the apathetic bureaucracy mired in corruption, indulged in subterfuge. The militants dictated their own terms for reporting which the journalists could ignore at the risk of their lives. The wily divided politicians played their crafty games as did a few media houses. In this scenario, journalists found themselves in a stifling and frightful situation. There was always that lurking fear of the gun. But much worse was the paucity of authentic information that could be weaved into convincing news stories and analyses. Information came in bits and pieces and at times there was no second line of source to cross check. Journalists were supposed to sniff and filter it, and they tried that. This book details how well they performed this difficult task. The book is divided into two parts. Book One broadly discusses the media machine and how newspapers are structured and how they functioned, business of newspapers and the manner in which technology is impacting it. Various filters that allow or stop news from reaching the public and various players that decide all this find adequate space. There is discussion on how media reported the Gujarat carnage and Kashmir trouble. There is discussion on prevention of deadly conflicts and the role of newspapers, particularly in resolving conflicts and bringing peace. And, finally what should be the role of media in general, particularly in reporting violence. Book Two details history of press in Punjab and tries to figure out why and how communalism infected it right from the beginning. The other part details the coverage of the Punjab crisis. Gobind Thukral has spent nearly three and a half decades as an active journalist with various leading newspapers: Indian Express, Financial Express, India Today, Hindustan Times and The Tribune in senior positions. He has reported not only from the states of Punjab, Haryana, Himachal Pradesh, Jammu and Kashmir but from the troubled spots of the north-east and Bihar. He has written on Indian Diaspora from Canada, America, Malaysia and Singapore. His extensive writings on rural India won him the prestigious Statesman Rural Reporting Award in the very year of its inception for reports on the migrant farm workers. His awards include one from his Alumina Association of Government College, Ludhiana and Panj Pani Award for excellence in journalism from Doordarshan Kendra, Jalandhar. Though his main interest is in political economy, yet Thukral covered his home state Punjab extensively at the height of militancy in the state. He writes a popular weekly column in Ajit, the largest selling Punjabi daily and is a regular contributor to The Tribune. He edits a Canada based a fortnightly web magazine, South Asia Post besides editing Haryana Review, a monthly published by Samvad, Chandigarh. 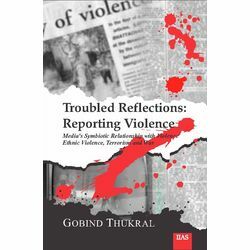 This book offers a firsthand account of reporting violence in Punjab, once considered toughest assignments for journalists. During the peak of militancy in Punjab from April 1978 to 1995, the journalists were at the receiving end of the morbid State and the trigger-happy melancholic militants. These torturous years were marked by a real fear of the gun, as a large number of editors, reporters and their associates were prey to the marauders in different garbs. It was also a period when information was hard to obtain and write about as the police laced almost each news story with lies and the apathetic bureaucracy mired in corruption, indulged in subterfuge. The militants dictated their own terms for reporting which the journalists could ignore at the risk of their lives. The wily divided politicians played their crafty games as did a few media houses. In this scenario, journalists found themselves in a stifling and frightful situation. There was always that lurking fear of the gun. But much worse was the paucity of authentic information that could be weaved into convincing news stories and analyses. Information came in bits and pieces and at times there was no second line of source to cross check. Journalists were supposed to sniff and filter it, and they tried that. This book details how well they performed this difficult task. The book is divided into two parts. Book One broadly discusses the media machine and how newspapers are structured and how they functioned, business of newspapers and the manner in which technology is impacting it. Various filters that allow or stop news from reaching the public and various players that decide all this find adequate space. There is discussion on how media reported the Gujarat carnage and Kashmir trouble. There is discussion on prevention of deadly conflicts and the role of newspapers, particularly in resolving conflicts and bringing peace. And, finally what should be the role of media in general, particularly in reporting violence. Book Two details history of press in Punjab and tries to figure out why and how communalism infected it right from the beginning. The other part details the coverage of the Punjab crisis. Gobind Thukral has spent nearly three and a half decades as an active journalist with various leading newspapers: Indian Express, Financial Express, India Today, Hindustan Times and The Tribune in senior positions. He has reported not only from the states of Punjab, Haryana, Himachal Pradesh, Jammu and Kashmir but from the troubled spots of the north-east and Bihar. He has written on Indian Diaspora from Canada, America, Malaysia and Singapore. His extensive writings on rural India won him the prestigious Statesman Rural Reporting Award in the very year of its inception for reports on the migrant farm workers. His awards include one from his Alumina Association of Government College, Ludhiana and Panj Pani Award for excellence in journalism from Doordarshan Kendra, Jalandhar. Though his main interest is in political economy, yet Thukral covered his home state Punjab extensively at the height of militancy in the state. He writes a popular weekly column in Ajit, the largest selling Punjabi daily and is a regular contributor to The Tribune. He edits a Canada based a fortnightly web magazine, South Asia Post besides editing Haryana Review, a monthly published by Samvad, Chandigarh.